This project was a collaborative project including myself as the lead applicant and Eleni-Ira Panourgia as the co-applicant. This event promotes collaborative interdisciplinary research practice within the university. 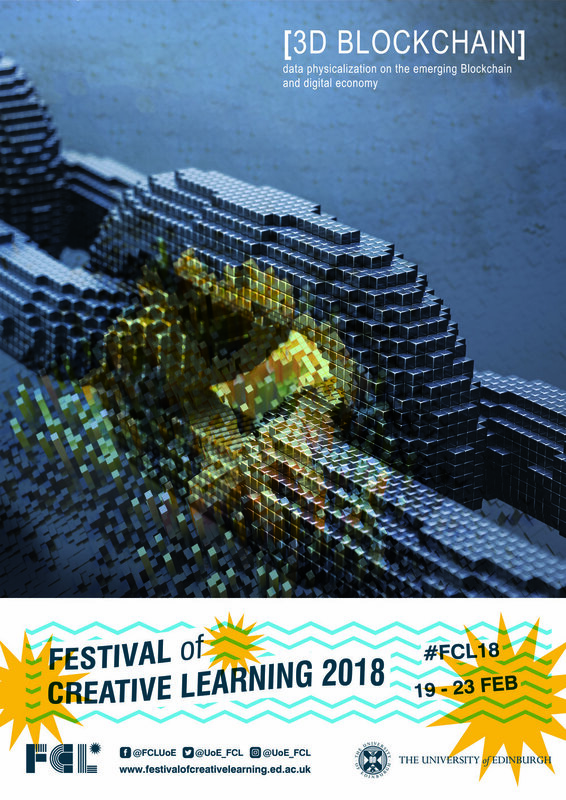 In this event, students develop knowledge and skills on working with data and developing narratives for making sense of big data through digital modeling and fabrication. It will be beneficial for UG, PGT, PGR students and staff within Edinburgh College of Art such as Architecture, Art, Digital Media and Culture, Digital Media Studio Project and Design Informatics to name but a few. It will also attract participants from the wider university community such as from Informatics, Engineering, Finance and the Business. 3D Blockchain is a big data physicalization on the emerging Blockchain and digital economy. Participants will experience a cross-disciplinary creative process focussing on digital practices and economies. This event will specifically focus on computational design, digital fabrication and sustainable practice models within the creative economy. In this event, we will be exploring Blockchain and data physicalization in the form of 3D printing. The digital economy and Blockchain have been widely explored within the University of Edinburgh. Prof Chris Speed, Chair of Design Informatics, is one of the leading scholars who have been actively communicating creative ideas in this area. We will be working with Bitcoin and Blockchain, its applications and values. The participants will be collaboratively developing ideas on Blockchain big data and will be creating narratives which help them to make sense of the streamed data from the Blockchain’s open source databases. The results of this creative process will be 3D printed and exhibited. This workshop/seminar event will not only contribute to ongoing activities related to digital design and fabrication and digital economy, it will also demonstrate the intangible data values through a tangible medium. This event will be running for 3days (Feb 19, 20, 22) in the format of 1-hour lunchtime seminars (1-2pm) followed by 3-hour digital making workshops (2-5pm). The venue of the event will be in the Edinburgh College of Art, in Minto House. Participants will be provided with materials and inductions on how to use databases and 3D printing equipment. We will have technical support from ECA (staff/PhD students and technicians) and uCreate studio. We will also have support from the University’s research networks such as sIREN. a practice-led and hands-on approach on creativity, economy, digital technology and entrepreneurship, addressing a contemporary debate on the topic in an all-round, innovative and mindful way. Copyright © Roxana Karam, 2018 | Unless otherwise indicated, all materials on this website are copyrighted. No part of these pages, either text, audio, video or images, may be used for any purpose unless explicit authorization. Therefore, reproduction, modification, storage in a retrieval system or retransmission, in any form or by any means, electronic, mechanical, or otherwise is strictly prohibited without prior written permission.